It’s been more than a year since our last review so you know this must be something special to get us writing again. Packaging – Nothing to shout about, no fancy artwork, just the toy in robot and vehicle mode. Comes packaged in robot mode in a black plastic tray. Robot mode – It is about as good as it gets. The last toy (by a new company) to excite me this much would be FansToys Quakewave (big shoes to fill but speaks much about the potential this company has). Double jointed knees, good articulation (even with those huge shoulder parts), cartoon accurate colours that really pop in hand, good use of diecast on the feet, thighs & smokestacks, wouldn’t go as far as to say it is perfect but you get the idea. Big robot with even bigger sword. Winning formula. Truck Mode – Transformation to truck mode is simple, nothing fancy, probably the simplest transformation I have seen in a while (depending on personal preference, can be both a pro or a con). Nice chrome, rubber wheels, rolls well on the ground, no signs of robot parts, once again, you get the idea. Conclusion – For a character that I personally didn’t have much affection for, Fans Hobby Archenemy really impressed me with its build quality, source accuracy and playability. Immense presence on the shelf, definitely a piece that most collectors will take a second look at (RID fan or not). For RID fans, I think it is a non-brainer, for non-RID fans, I will still highly recommend it. I wasn’t a big fan of the Monsterbots (just not a fan of the characters) nor the Ginrai and Overlord (huge fan of the show but the bulky aesthetics really don’t work for me) that Fans Hobby had teased / released, but on account of this, I will definitely keep a close eye on them. The toys comes in huge styrofoam packed boxes which was a really nice touch, especially for G1 fans (like myself), guess it’s not the most environmentally friendly solution but keeps the toys snug and safe. They come out of their boxes in Dino mode. Except for the somewhat over-sized body for Swoop, the rest of the Dinos are well proportioned, very loyal to G1, and very very bling. The robot modes are great as well. What Toyworld has done very well was to create very good individual modes (both Dino and Bot) which except for Grimlock, you might be hard pressed to imagine that they can actually combine. Well articulated, everything is pretty much spot on. The weakness link would probably be Grimlock (who could do with bigger legs). The only other complaint I can think of would be the somewhat small waist for all the other four members but it isn’t really something major. 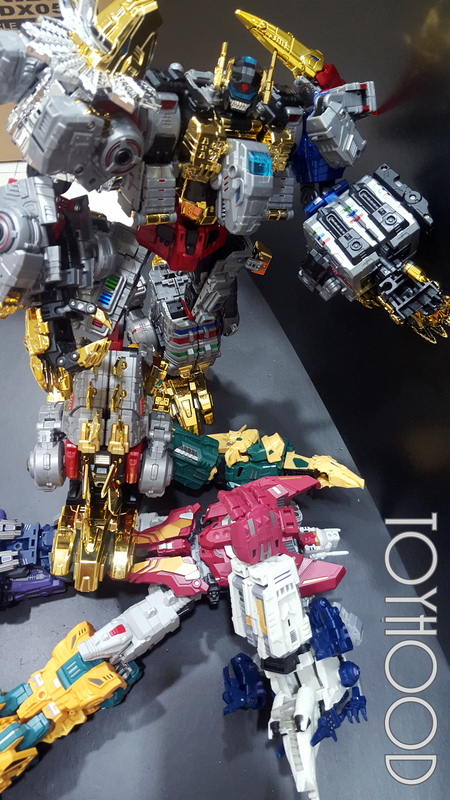 I guess the other way to look at it is that it does give the impression of bulk for the individual robot modes (with the proportionally bigger shoulders). Combining the Dinobots wasn’t as enjoyable as let’s say, combining UT Ordin. The limbs are more or less the Dino modes with the mid section pulled out for the elbow joint (which is definitely the way to go for combiners) and the Dino limbs folded up for the leg joints. Grimlock was once again, the most difficult component and I had some trouble trying to put on the extra shoulder cover while ensuring everything was tabbed and stayed together. Once combined however, it is a sight to behold. Honestly, I have yet to see photos that does justice to this combiner. For some reason, it looks that much better in hand than on camera. But of course, it is not without its flaws. The small waist, hips and thighs coupled with the huge dino lower legs does make it look somewhat clumsy. Other than the obvious solution of having made the waist and hips bigger, one thing that Toyworld should have done was to somehow allow the dino legs to be hiddem so that they don’t add to the bulk of the already massive lower legs. I am not a fan of the wings simply because they look puny compared to the combiner and serve to make it look even less proportional. Hence, I decided to move them to the sides and in my opinion, it looks better and gives the combiner a bit more character. Also, balances out Swoop’s dino head which is awkwardly pointing towards the combiner head. With so many Dinobots out on the market, is this the right Dinobot for you? If you want a combining Dinbot, you current choices are only between Toyworld and Gcreation. 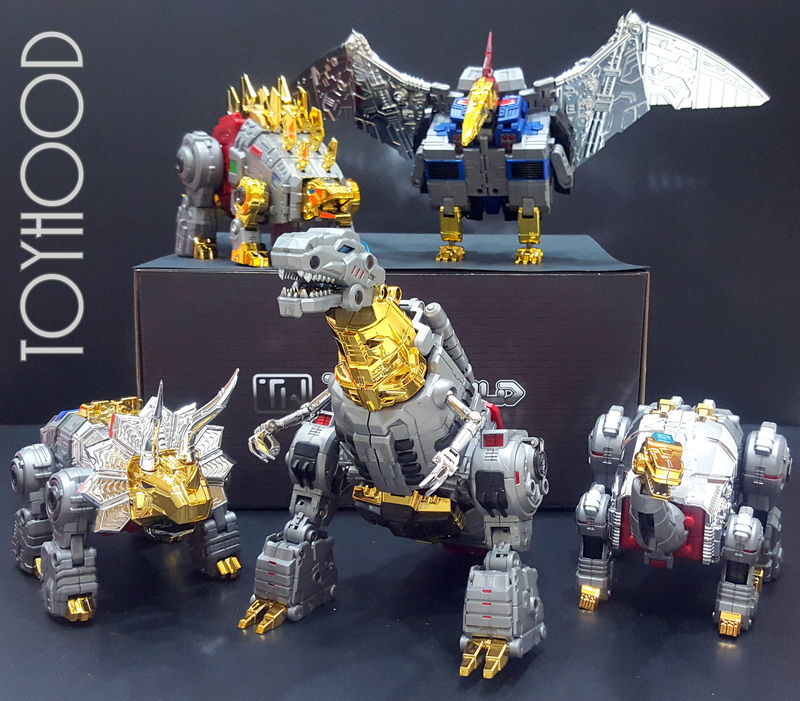 If you appreciate the delicate balancing act put up by Toyworld, in terms of the outstanding individual robot and dino modes, with maybe a compromise on the combined mode, then this is definitely for you. If the combined mode is all that matters to you, you might want to hold out to see what Gcreation Shuraking has to offer when the full team is out (does look awesome from the prototype photos shown so far). Having said that, having handled both toys, I would be inclined to say that Toyworld has the better quality. All in all, I’m just glad that Toyworld has brought to life what many of us could only previously dream about, a Dinobot combiner. And an incredibly awesome one at that. Enough talk, WE DINOBOTS CRUSH DECEPTICONS! For our first collector’s showcase, I felt it would be apt to ask someone who was instrumental in my own collection journey, my long time friend, Poh, who really is the epitome of what Toyhood should be all about. How? When? I was introduced to the world of toy collection by my BMT (Basic Military Training) instructor who brought me to the flea market at Clark Quay (where it all started for most Singapore collectors) and my first ever toy purchase was a loose and complete G1 Star Saber for $120. From then on, every Sunday I would be there, spending almost all of my $700 NS (National Service) allowance on most G1 and G1 reissues toys (the Takara G1 reissue book series started around then). After NS, I went to University and stopped collecting for a while (busy chasing girls in school). It was not until you (yes, me the editor) suddenly message me one day and asked about a particular Transformers Masterpiece toy and whether it was worth its price (It’s interesting how I got the guy who got me into collecting back into collecting). That stirred my interest and the next Sunday, I was down at the new toy haunt (China Square Central) and there and then, my first ever pre-order was done, the Hot Toys Iron Man Mark VII. From Iron Man, the collection grew to the Avengers, Batman, and one day, I just decided that I will set out to get back all the childhood toys I ever had. So, from Transformers Victory, to Lego, to Power Ranger, Grendizer, Golden Lightan, Getta Robo G, God Raijin Oh (I have absolutely no idea what the last two are). My appetite for my collection grew and soon, I was upgrading my vintage Transformers to MIB specimens. Worst part of collecting? Worrying about how my toys will yellow with time despite doing everything to prevent it. Best part of collecting? Relieving my childhood though my collection and the feeling of finally owning the toy after so many years. And so I told my friend, see, I teach them how to be organized. You’re welcome. Any words to the readers? (let’s assume there are some) Collecting is not equal to competing. It puzzles me why a joyful hobby like toy collecting can turn into ugly quarrels, especially online. Whether a person is a box collector, or prefer to display their toys, it is his own choice. Everyone has the right to do what they want to with their own collection. To the spouses of toy collectors, be like my wife. No questions asked. When she married me, she promised to love all my toys. And no, I didn’t force her to say that. *The opinions expressed in italics in this article are the editor’s own, do not reflect the view of Poh and should not be taken to be the truth even though they probably are.